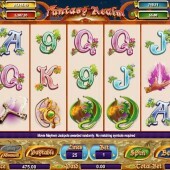 Fans of IGT’s fantastic Pixies of the Forest slot and WMS Gaming’s magical Crystal Forest slot will be pleased to know that Amaya have their own fairytale slot - Fantasy Realm. 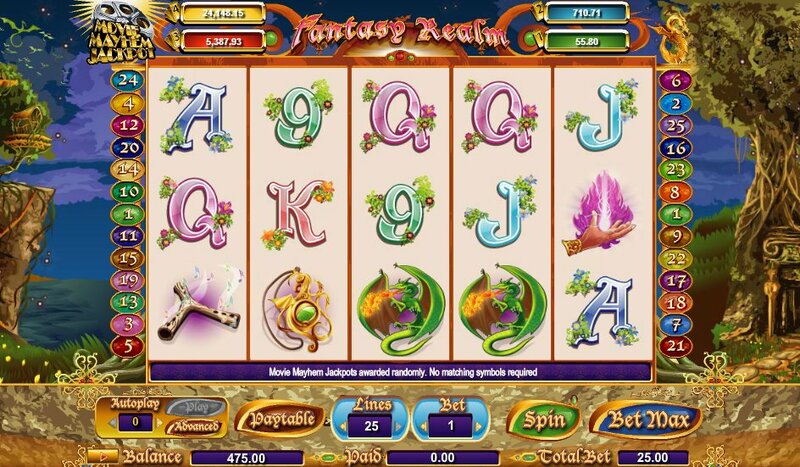 Fantasy Realm 5-reel, 25-payline online slot from Amaya with a range of symbols from the world of fantasy including dragons, fairies, elves and Centaurs. The Wild symbol is represented by the elf queen and she substitutes for all other symbols except for the Scatters on this slot. She only appears on Reels 1 and 5 so keep a close eye on those two reels. She is doubly important because she is also the key to triggering the free spins bonus round. You can win 25 free spins if you hit the elf queen on Reels 1 and 5 simultaneously. The Scatter on this slot comes in the form of the Centaur. A mythical beast that you will definitely have encountered before if you’ve read the Chronicles of Narnia by C.S. Lewis, this half-man, half-beast creature will reward multipliers if you hit him across the reels. Fantasy Realm is also linked into the Movie Mayhem Jackpot which I found quite surprising considering this slot has no real authentic links to a movie that I know of. Anyway, this jackpot is randomly-triggered and paid out to anyone playing on a Movie Mayhem Jackpot slot at that time. This slot has a lot going for it but you might feel a bit short changed with the Wild acting as a bonus trigger. Essentially, they have just given the Wild some Scatter duties and it feels like it does take an edge off the game. I’m not the biggest fan of fantasy slots as it is and the lack of any real innovative game play on this slot did little to change my perspective on fantasy slots.